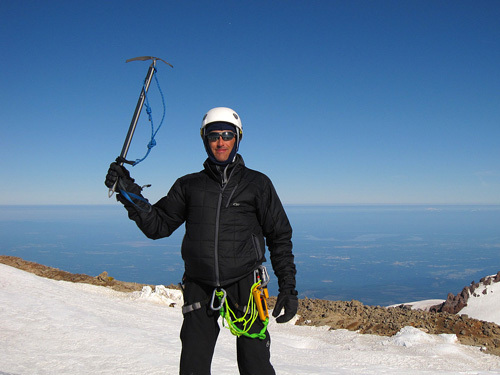 Dave Dogruel is a valued member of the Los Alamos Mountaineers. Over the years he has served the club very well indeed as President, Vice-President, Climbing School Director, Climbing School Instructor (for years), and Program Chair. He has been our A/V Potentate (audio and video man for club presentations) since 2003. Dave has lived in northern New Mexico all of his life. He learned to rock climb from friends while attending college at New Mexico Tech, and learned to climb better after taking the LAM Climbing School in 1988. Lately, he has been bitten by the trail running bug and has completed half-marathon off-road races and is working his way up to marathon distance. Dave semi-retired from doing scientific research at Los Alamos National Laboratory, and currently works at REI in Santa Fe as a sales specialist. Unfortunately, he still doesn't get to play outside as much as he would like. Life is not all work however; read about his recent LAM Presentation.